With the help of some outstanding weather for April in Ohio. The Bluecoats just finished the final camp of the 2003 season on April 20 at their drill camp location -- Perry High School near Cleveland. This facility boasts an indoor practice field and a stadium paved with artificial turf. Goals attained at this camp included putting the finishing touches on the musical program for the 2003 production of "Capture and Escape," and completing the first three minutes of drill written by visual designer Mitch Rogers. According to Bluecoats' program coordinator Larry Hershman, "During the winter, we rehearse in both Texas and Ohio. The April camp is the first time everyone is together, and it's always exciting for the members and the staff." 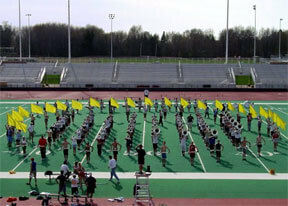 Corps director Bill Hamilton added, "The progress we made at this camp was outstanding both on and off the field. We were also able to finish work on our trucks, uniforms, paperwork and setting up the tour. Unfortunately, one of our tuba players suffered an injury, which was not corps-related, so we are actively recruiting for that position. Otherwise, the corps is full." The Bluecoats will resume spring training in late May, when the corps moves into Fort Indiantown Gap, Pa., where they will rehearse every day to finish the 2003 program. For complete details about the 2003 Bluecoats Drum and Bugle Corps please visit www.bluecoats.com.